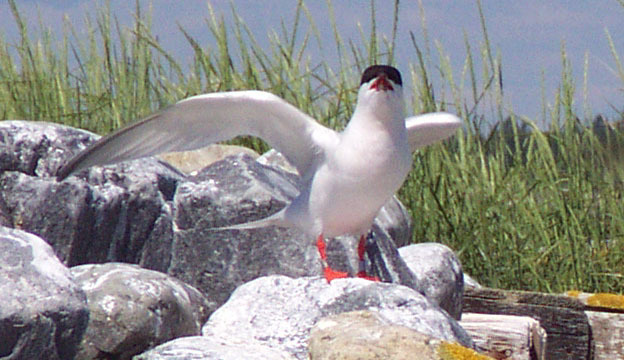 The following is a synopsis of the tern status in southwest Nova Scotia for the 2001 nesting season. My "tern" work and observations deal primarily with the tern colony on The Brothers. These two tiny islands are located about 1 km offshore from Lower West Pubnico in Yarmouth County. Tern nest numbers increased quite dramatically to 880, from 491 the previous year. The number of Roseate Tern nests located on these islands went down to 70 from the previous year's high of 86. 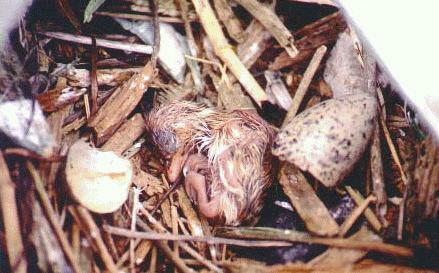 However, Roseate Tern chick survival was probably higher than in 2000. At least 27 Roseate chicks were expected to fledge. Few Roseate eggs remained unhatched and only one Roseate chick was found dead. 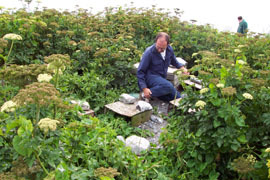 No gulls nested on these islands in 2001 and there appeared to be very little owl predation. One Banded Roseate was seen several times on North Brother. It was the only banded tern observed. The characters on its left band looked like "5N" over the characters "70". I would not swear to the correctness of this, though I am pretty sure of the "5" and the "7". This year was the first time I really watched the terns to identify the type of fish they were bringing in. At least on July 10 and July 22, the main fish brought in were Sand Lance (Ammodytes americanus). A few terns brought in Mummichog (Fundulus heteroclitus), and one brought in a species of hake. This was the first time I saw Sand Lance on The Brothers. None were observed with Herring though this does not mean no Herring were brought in. 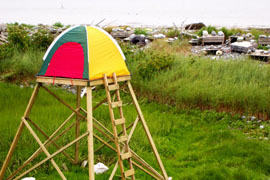 This spring I erected an observation platform on North Brother. It served me well on a few visits there when I made a few observations from it in a small nylon tent, brought to the island for that purpose. In April I also placed two 9'x12' tarps over a couple of places where, each year, the vegetation gets rather thick and less productive than the less vegetated areas. 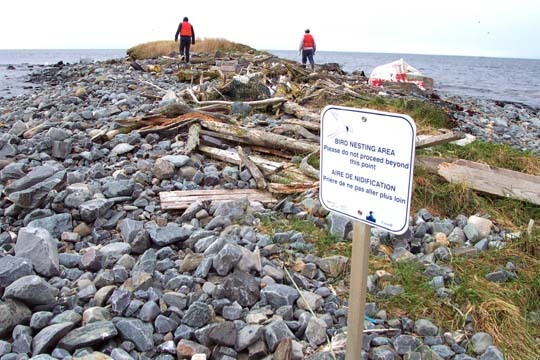 The tarps were covered with beach gravel upon which nesting structures were placed. I expected this area would be colonized by the Roseates. As it turns out, very few terns nested there, though these areas were used as feeding stations. Pinch Gut Island, a small island near Wedgeport, lost its tern colony this year. Last year there were close to 400 nests there; this year, none. An estimated 200 pairs of terns nested on another small island about 6 or 7 km away. This island, "Green I." 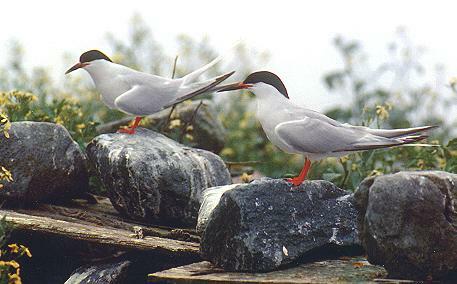 on the charts and locally known as "Île-aux-fraises", is a historical tern colony site. Years ago the colony abandoned the island when a couple of rams were placed on there to graze for the summer. Sheep are no longer placed there. I have a good feeling about this island as an upcoming and vibrant tern colony. 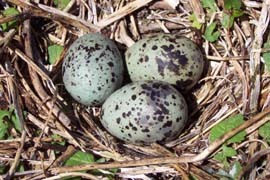 Île Chespeque in Pubnico Harbour had a dozen or so Common Tern nests. Possibly only a few fledged. The Thrum I. (about 5 km northwest of The Brothers) may have had about 25 Common Tern nests. Gannet Rock probably fledged about 6 Arctic Terns. I was not able to visit Flat I. this year to do a nest count. 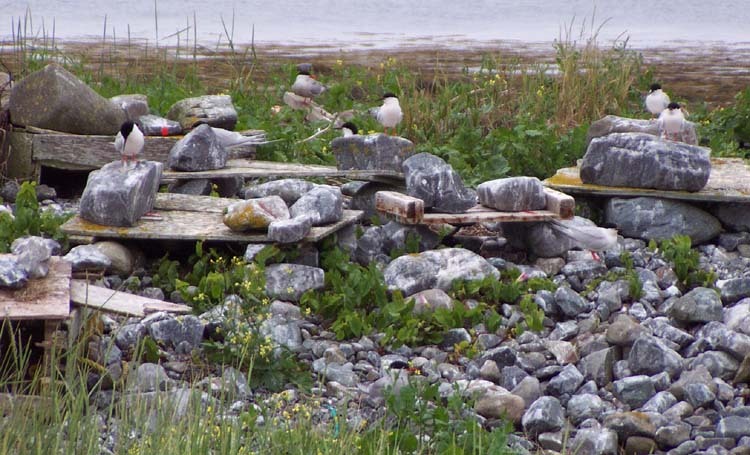 For the past few years about 20 Arctic Tern nests were found. I would expect the same this year. I expect Round I. had about 10 Arctic Tern nests also this summer, though I did not get the chance to check it out either. The weather during June and July was rather windy and/or wet or cold. I was not able to visit the more distant islands as I had wanted to. However, tern nesting success appears to have been good; certainly at least, on The Brothers. 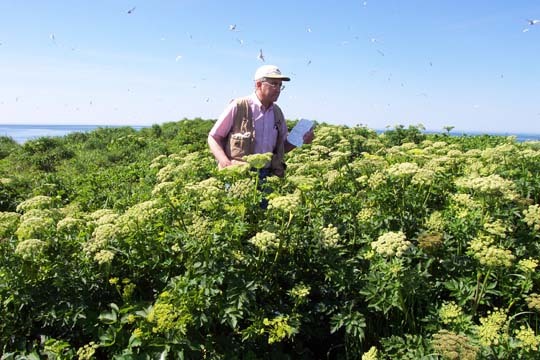 The following is a chronological listing of my year 2001 work with terns in general, of the Lobster Bay area, but especially with the Roseate Terns of The Brothers. The report also includes tern observations from other local residents. 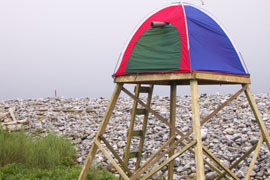 April 8, 2001 -I erected an observation platform in the hollow of North Brother (N. Brother). In June and July, a portable fabric blind will be temporarily placed on the platform to observe the Roseate Terns for leg bands, etc. 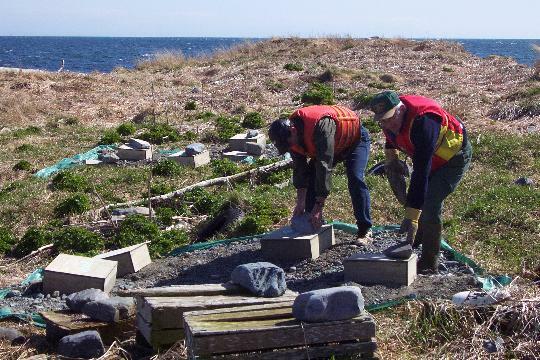 Two 9'x12' tarps were placed on an area heavily vegetated by summer and with relatively low tern production. This location was just to the south of the most productive Roseate Tern area. 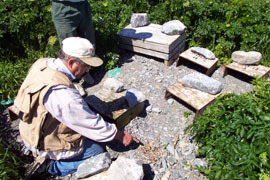 The tarps were then covered with gravel upon whicn nest shelters were placed. 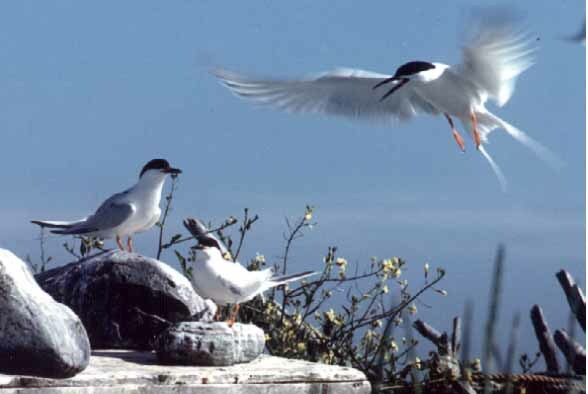 The most productive area for Roseate Terns on the island is in shelters on a sparsly vegetated gravel area. I am sure these tarps will be very productive. My helpers: Alix and Rémi d'Entremont with Marcel d'Eon. 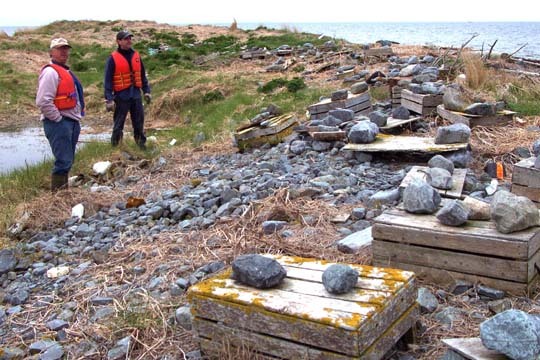 April 23, 2001 - Lobster fisherman, Ellis d'Entremont, reported 3 terns a few km west of The Brothers. April 25, 2001 - Ellis d'Entremont reported another single tern west of The Brothers. 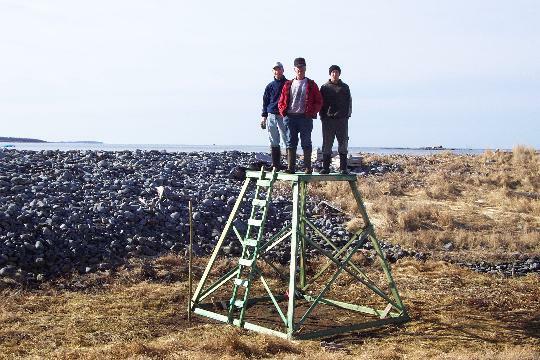 April 28, 2001 - I brought another 9 Roseate Tern nest shelters to N. Brother. They were all placed on the gravel-covered tarps. My helpers: Andrew D'Eon and Jean-Bernard d'Entremont. Andrew and Jean-Bernard setting up Roseate Tern shelters on the tarps. 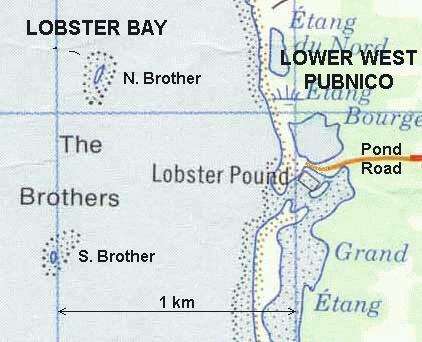 May 2, 2001 - Lobster fishermen Edouard D'Eon, Réal d'Entremont and Robert Nickerson reported seeing about 15 terns above The Brothers. 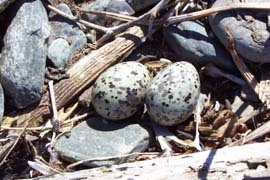 May 5, 2001 - Checked out both Brothers for gull nests and fixed up a few more Roseate Tern nest shelters on N. Brother. No gull nests were found. A few terns were above South Brother (S. Brother). About 50 terns were on N. Brother. Most of the terns appeared to be Common. My crew: Andrew D'Eon and Rémi d'Entremont. 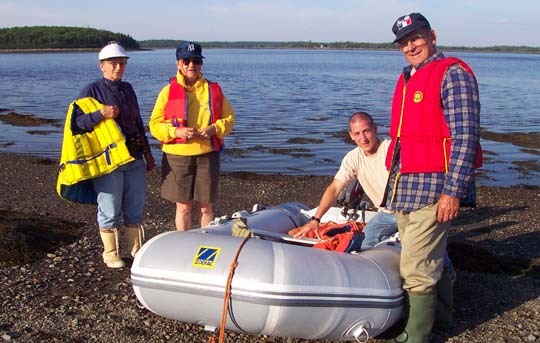 May 9, 2001 - We motored by N. Brother on our way back from Gannet Rock. About 300 terns were on and above the small island. I could hear only a few Roseate Terns and I expect these had only begun to arrive. A great treat was the viewing of 2 Roseate Terns among the Arctics and Commons resting on the beach rocks near the water's edge. Their rose tinted breasts were clearly evident and made these terns stand out among the others. No viewing aids were needed to see this. On May 7 and 8 I had checked out The Brothers from the mainland with my spotting scope. Very few terns were seen above S. Brother, however, I estimated about 200 on N. Brother. The terns seem to have settled on the island sooner after their arrival than on previous years. May 12, 2001 - 7:00 pm - Revisited The Brothers to check for gull nests. None were found on either island. 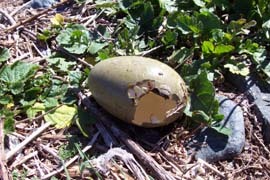 The empty shell of a depredated Common Eider egg was found on S. Brother. There were no terns to be seen at S. Brother; 3 or 4 terns were seen high above the north island. 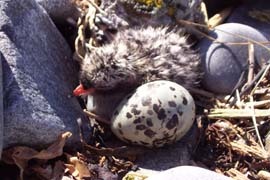 Two tern nests containing one egg each were found on N. Brother. We then visited Whitehead island located about 4 km to the north-west. The vegetation of the island was cropped short by resident sheep and a flock of 75 or so Brant. The Brant were resting on the water nearby as we approached the island. On Whitehead, we estimared about 200 Great Black-backed Gull nests with eggs. My crew: Alix d'Entremont, Jerome D'Eon and his son, Benjamin. May 13, 2001 - 9:00 am - Viewed The Brothers from the mainland with my spotting scope. The terns were there again in good numbers. 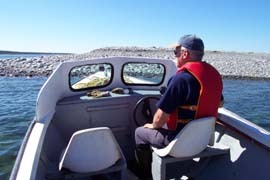 May 25, 2001 - Jean-Bernard d'Entremont took me to The Brothers in his boat. No gull nests were found on either island. There were a dozen or so terns above S. Brother. About 700 terns were at N. Brother. 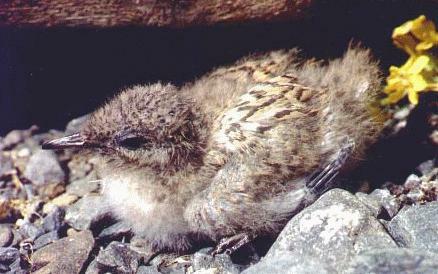 One tern nest was found on the south island. 223 tern nests were counted on N. Brother. None of these were Roseate Tern's. There appeared to be fewer Roseates than I expected to see. I guess the majority had not arrived yet. Another depredated Eider egg was seen on S. Brother. One Common Eider nest containing 3 eggs was found on N. Brother. 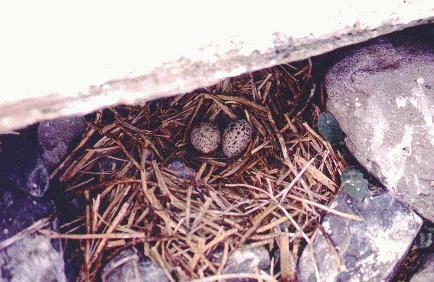 June 9, 2001 - Tern Nest Count on The Brothers. A 79% increase over last year!!! 63 tern nests were counted on S. Brother and 817 on N. Brother. The number last year was only 491! 53 of these were Roseate Tern nests. I expect in a few weeks the Roseate Tern nest numbers should approach 80. The condition of the islands was great. 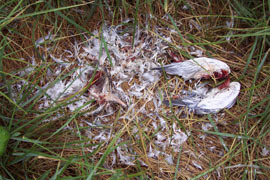 We only found two dead adult terns. One of these was a Roseate. 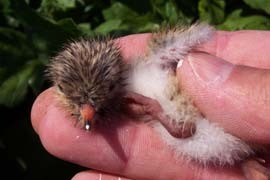 Only one tern chick was hatched. 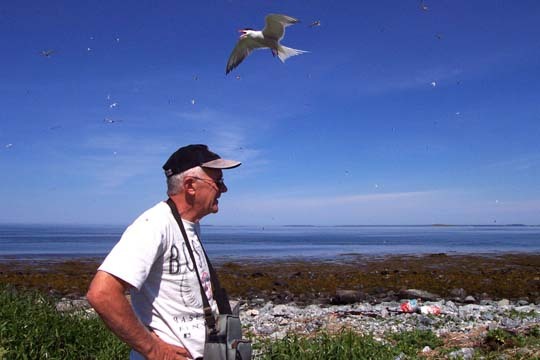 June 19, 2001 - Jean-Bernard returned with me to The Brothers to check the Roseate Tern nest numbers again. The numbers had now increased to 66! There were now 7 on S. Brother and 59 on the north island. No gull nests were found. Lots of Common Tern chicks were present. Six Roseate Tern chicks were found. All were about 4 days old or younger (my guess). We did not find any dead adults nor chicks of any species. This was a pleasant surprise. Usually there are quite a few. The islands appeared in great shape. I was disappointed that the gravel covered tarps had not worked out as well as I had expected. Only a few Roseates and Commons had made their nests there. The vegetation in the tarp areas had grown about a metre or more tall. The main plant species growing there looked like water-hemlock or water-parsnip or some similar looking plant. There was the possibility of more Roseate Tern nests in that tall vegetation. We did not investigate. June 26, 2001 - I visited Pinch Gut island (a.k.a. "île-aux-maringouins") for the first time this year. Last year there were almost 400 tern nests there; this year, none! A good portion of the missing terns were found on a small island at the southern tip of Wedgeport identified on the charts as "Green island" but known locally as "île-aux-fraises". We did not land on this island but only circled it in the boat. Perhaps as many as 200 tern nests could be there. Most of the terns were Commons. 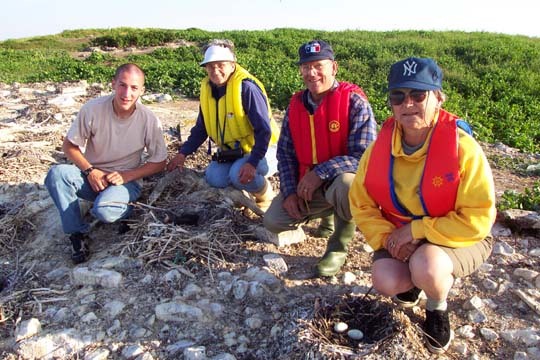 Pauline, Dolores Ann, Alix and Melford on Pinch Gut I.
Île-aux-fraises is a historical tern nesting island. Years ago a ram or two were placed on the tiny island for summer grazing. The terns left the island. It is great to see them back there. Perhaps this time they will be left in peace. We also visited the Double-crested Cormorant nests on Inner Fish I. My crew: Alix, Dolores Ann d'Entremont, Pauline d'Entremont and her husband, Melford. July 10, 2001 - Observation day on N. Brother. We installed a child's nylon tent on top of the observation platform. Andrew D'Eon and my younger brother, Roland, helped me with the gear. From the tent, I viewed dozens of adult Roseate Terns and many Commons but none carried any leg bands. Adult Roseate Terns were bringing in Sand lances (Ammodytes americanus) to feed their young. Commons were seen bringing in Sand lances as well as Mummichog (Fundulus heteroclitus). None were observed with herring. Some terns were still incubating their eggs. We also checked out the Roseate Tern nests and chicks. Four more nests were found bringing the total now to 70. 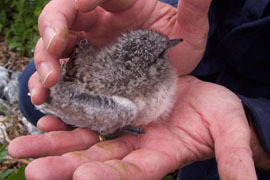 Twenty-two Roseate Tern chicks were found. There were no dead Roseate chicks nor dead Roseate adults, however, there were several dozen dead Common Tern chicks and one adult had been depredated by an owl. The vegetation had invaded the two nesting areas which had been covered over with 9'x12' tarps to prevent this from happenning. Only a few terns nested there. 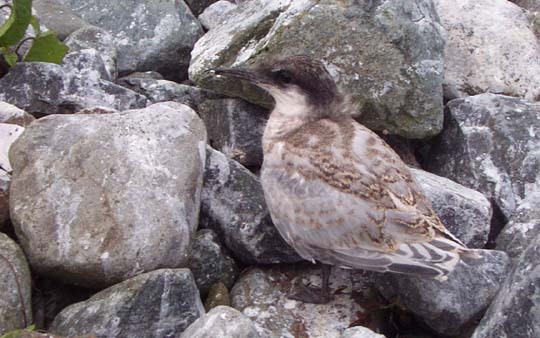 July 15, 2001 - Four more live Roseate Tern chicks were found on S. Brother bringing the total to 26. One more, a 2 day old was found dead. A banded adult Roseate Tern was seen on N. Brother. It was banded with aluminum-like bands on both legs. The one on the right leg was narrower than the one on the right leg. July 22, 2001 I set up my small tent on the observation platform on N. Brother to see if I could read anything on the leg bands of the banded tern with my spotting scope. The tern arrived in a short while and the best I could read looked like "5N" over the characters "70" on the left band. No other terns appeared to carry leg bands. Another previously uncounted Roseate chick was found on N. Brother. This chick, about 2 days old, would bring the Roseate Tern chick number to 27! It was in nest #68 which, on July 10, I had entered in my notes "#68 under a crate end - 1 egg (cold)". I guess it was more viable than I believed! Again, the fish the terns were bringing in were mostly sand lance. One was observed bringing in a Hake. None were seen with Herring.